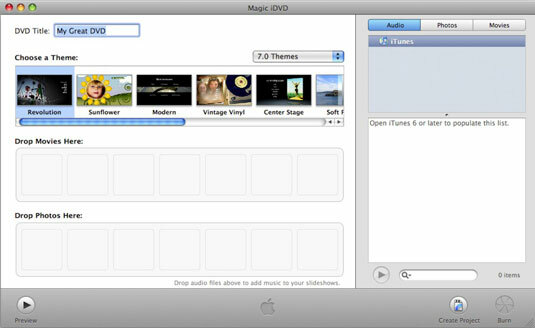 Burning a copy of your movie or photo slideshows to a DVD disc enables you to create a disc you can give or send to another person, who can then enjoy your movie on their computer TV. The iDVD program comes preinstalled with all new Macs, and also with the iLife suite of programs that you can purchase separately. 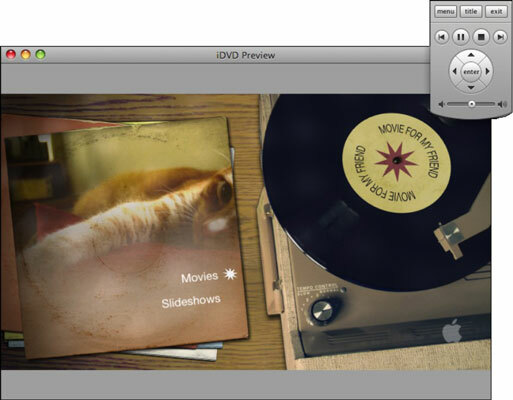 The Magic iDVD option provides predesigned templates that you can customize to create DVD menus. To burn DVDs using iDVD, you need a Mac with a DVD drive that can write to DVD. If your Mac’s DVD drive can’t write to DVD, you can purchase an external DVD drive that can burning DVDs, or you can transfer your iDVD project to another Mac to create your DVD. Click the iDVD icon on the Dock (or double-click the iDVD icon in the Applications folder). In the iDVD welcome window that appears, click Magic iDVD. The Magic iDVD window appears. Type a descriptive name for your DVD in the DVD Title text box. Choose a theme, such as Vintage Vinyl or Sunflower, from the Theme browser. Each theme offers a different appearance for your DVD menus. The theme names are pretty self-explanatory. In the Media pane (on the right) of the Magic iDVD window, click the Movies tab. A list of movies stored in your Movies folder appears. If you don’t see the movie file you want, navigate to the folder containing that movie file. Note: Video files you copied from your Flip to your Mac using FlipShare are stored in the Movies, FlipShare Data, Videos folder. Click and drag a movie that you want to add to your DVD onto the “Drop Movies Here” drop well. To select multiple movies, hold down the Command key and click each movie you want to add to your DVD. If you click a movie and click the Play button, you can see a thumbnail image of your movie. In the Media pane, click the Photos tab. A list of photos stored in iPhoto appears. You can drag and drop any picture file from anywhere on your computer’s hard drive to the “Drop Photos Here” section of the iDVD main window. Click and drag a picture that you want to add to your DVD onto the Drop Photos Here drop well. To select multiple pictures, hold down the Command key and click each picture you want to add to your DVD. Each drop well represents a separate slideshow. Generally, you want to put several pictures in the same drop well to create a slideshow of multiple pictures. Underneath each drop well, iDVD lists the number of slides currently stored. In the Media pane, click the Audio tab. A list of audio files stored in iTunes and GarageBand appears. Click and drag an audio file that you want to play during a photo slideshow onto the “Drop Photos Here” drop well. Pictures that include audio appear with an audio icon over them. Magic iDVD is smart enough to time the audio file you added to the length of your video. For example, if you add a 3-minute audio file over a slideshow (in the drop well) that contains three slides, each slide will appear for 1 minute: that is, timed until the entire audio file finishes playing. Likewise, if you add a 3-minute audio file to a slideshow of 30 slides, each slide appears for 0.1 minutes (6 seconds). So, the more slides (pictures) you add, the faster the images pop up and disappear while the audio file plays. Click the Preview button in the lower-left corner. An iDVD Preview window appears with a controller (which mimics a typical remote control) so you can take your DVD through its paces to make sure it works the way you want. Click Exit on the controller on the screen. The Magic iDVD window appears again. Create Project: Save your DVD design to modify it later. Burn: Burns your music, pictures, and movies using your chosen DVD theme. If you choose this option, you’ll need to insert a recordable DVD in your Mac and then follow the prompts to burn the DVD.